As 2019 approaches, we take a look ahead at the most exciting yacht projects due for completion in the next 12 months. After being in construction for five years, Project 814 was finally unveiled at her launch in October 2018. The yacht is now undergoing further commissioning work, including the addition of balconies and wing stations and will remain covered during the winter. 814 features an interior design “akin to a beautiful and contemporary jewellery box" and includes a two deck IMAX theatre, fully certified helipad and various sports facilities. 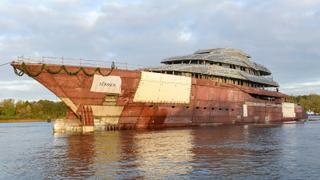 Feadship has promised Project 814 will be seen in her “splendid glory" next spring. As 2019 approaches, we take a look ahead at the most exciting yacht projects due for completion in the next 12 months. After being in construction for five years, Project 814 was finally unveiled at her launch in October 2018. The yacht is now undergoing further commissioning work, including the addition of balconies and wing stations and will remain covered during the winter. 814 features an interior design “akin to a beautiful and contemporary jewellery box" and includes a two deck IMAX theatre, fully certified helipad and various sports facilities. 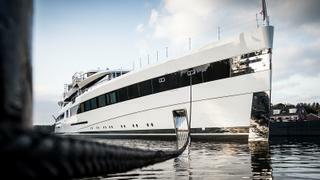 Feadship has promised Project 814 will be seen in her “splendid glory" next spring. 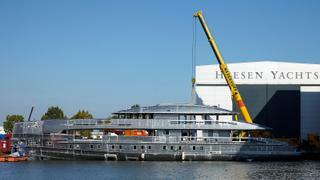 Designed by Gregory C Marshall, the 80 metre yacht from Nobiskrug is being built from steel and GRP. A key feature of the design is an impressive central section of glasswork, which includes 223 pieces of glass and weighs around 70 tonnes. This particular feature convinced the yard that no-one else would be brave enough to build it. This latest project from the Privinvest-owned yard is set to complete construction in 2019. Sold in 2015 and launched in October 2017, Lürssen's 95 metre Project Fiji has been a long time coming. This steel and aluminium yacht features exterior design by Harrison Eidsgaard - a first for the London-based studio - while Laura Sessa Design is behind a "contemporary and modern" interior décor. Delivery to Project Fiji's American owner is due to take place next year. The first superyacht by commercial shipyard Ulstein Verft known as Olivia O is set to become one of the world's largest explorer yachts when she is delivered next year. 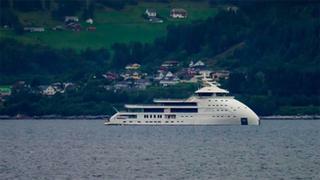 Designed by Espen Øino, the explorer was filmed undertaking sea trials in August this year. She is the first superyacht project for Ulstein Verft, which has been building offshore support vessels and commercial craft in Norway for the past 99 years. Project Ragnar, which was previously an icebreaker called Sanaborg, is being converted into a luxury explorer, with the transformation due for completion next year. Icon Yachts previously said that the aim of the conversion was to balance British heritage and medieval warship design influences with sleek modern lines. When complete, Project Ragnar will boast an Ice Class A1 hull, ideal for global exploration, particularly in high latitude areas. The 49.8 metre Heesen motor yacht Project Boreas, which was sold in November 2017, is due for completion in July 2019. Comprised of an aluminium fast displacement hull developed by Van Oossanen Naval Architects and an aluminium superstructure, Project Boreas is based on the Nova Plus platform and inherits a striking exterior profile from her predecessor, Home. She will be finished in metallic grey, adding a quasi-militaristic edge to the design. Designed in-house by the CRN Engineering team with exteriors by Studio Zuccon International and interior design by Studio Laura Sessa, CRN Project 135 was originally slated for a 2018 launch. 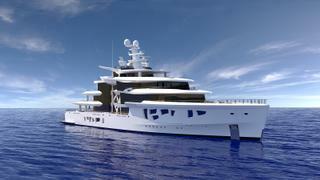 When complete, the yacht will accommodate 12 guests across six cabins, as well as up to 39 crew members. Ferretti Group has previously billed this yacht as one of the most important and innovative launches in the 54-year history of CRN Yachts. The 64 Steel, Sanlorenzo's new flagship yacht, was sold in July 2016, with the project due for completion next year. The steel hull and aluminium superstructure were joined at the yard's La Spezia facility in July 2017. Key features include an aft-deck superyacht swimming pool with a glass base, allowing natural light to filter through to the beach club below. 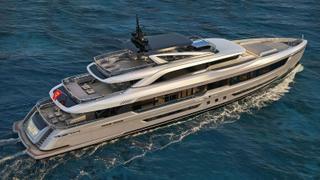 Meanwhile, the large foredeck area features a touch-and-go superyacht helipad. 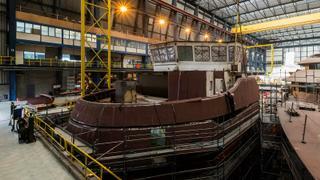 The first hull in Damen's SeaXplorer range is set for delivery next year. The SeaXplorer 65 was first revealed at the 2015 Monaco Yacht Show and was sold in August 2016. The model combines luxury with commercial ship capabilities and offers accommodation for 12 guests, with space for 20 crew. 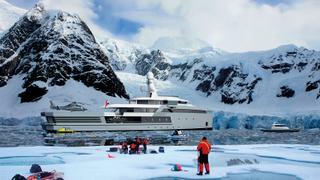 The Damen SeaXplorer team worked with EYOS Expeditions — which organises trips to ice destinations with superyachts — to ensure that the range will have an exceptional expedition performance. 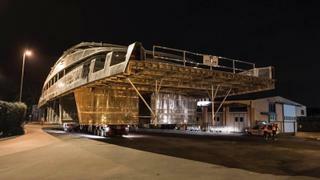 The assembly of Mengi Yay’s Project Virtus has been completed and the yacht remains on track for a mid-2019 delivery. 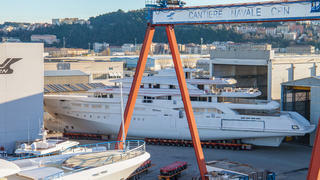 Once launched, Virtus will become the yard’s second largest motor yacht behind the 45 metre Aquarius. Developed in collaboration with Ginton Naval Architects, this 43.6 metre aluminium yacht will feature interior design from BTA Design and VYD Studio, which also created the exterior lines.